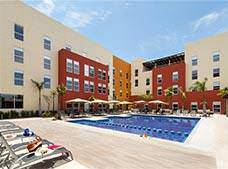 City Express Suites Cabo San Lucas is an affordable business hotel with a convenient location on the Transpeninsular highway in Cabo San Lucas. It offers breakfast, meeting facilities, wireless Internet access, and coffee service in the lobby. The suites are comfortable and equipped with kitchenettes, sofa beds, and air conditioning. Enjoy a pleasant and productive stay in Los Cabos when you choose this attractive property! These spacious 300 sq. ft. suites have a living area with a sofa bed, a separate bedroom, a fully equipped kitchenette, and modern amenities. These spacious 420 sq. ft. suites have a living room with a sofa bed, a sleeping area, and a kitchenette. They are equipped with modern amenities. These spacious 505 sq. ft. suites have a living room with a sofa bed, a sleeping area, and a kitchenette. They are equipped with modern amenities.